A lot of water is still being released from Conowingo Dam and with more rain in the forecast, it is doubtful flows will be reduced anytime soon. Stained water conditions have made fishing for striped bass difficult in the lower Susquehanna River but slightly better south of Turkey Point. Most anglers are casting jigs, crankbaits and swimshads in the shallower waters near shoreline structure. 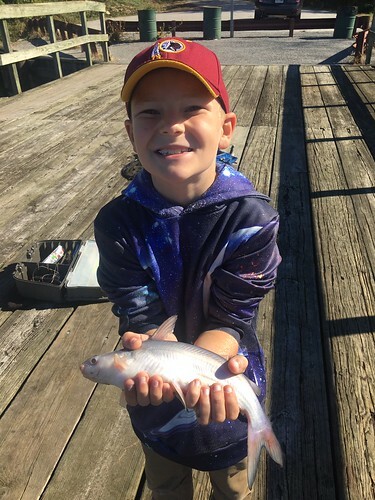 Two bright spots for anglers have been excellent fishing for channel catfish, and also yellow perch are showing up in the local tidal rivers and creeks. From Rock Hall south to the Bay Bridge, anglers are trolling and jigging along channel edges where striped bass can be found suspended. The steep channel edges at Swan, Love and Podickory points have been favorite places to look. Trolling has been one of the more popular methods of searching for suspended fish that tend to be holding at depths of 30 feet or more. Many angler say they are marking fish, but getting them to bite is another story. Those trolling are pulling umbrella rigs rigged with sassy shads or spoons behind heavy inline weights. Single or tandem rigged bucktails, sassy shads or spoons can be rigged behind planers, and chartreuse tends to be one of the more productive colors. Breaking fish are being spotted in the region and nearly all are 12-inch to 14-inch striped bass chasing bait. Jigging underneath with large soft plastics in the 5-inch to 6-inch size range helps discourage the smaller striped bass and sometimes entices larger fish to strike. Structure tends to hold striped bass and the sewer pipe near the Chesapeake Bay Bridge, as well as the bridge’s piers and rock piles, usually have fish holding near them, making them favorite places to jig. Live-lining small eels this time of the year is always a great way to catch striped bass. Eels are like candy to rockfish; if you can locate some, odds are in your favor. There are still a few people chumming and chunking but as water temperatures approach the 50-degree mark, these methods of fishing are less productive. Low salinity values in the upper bay have caused channel catfish to freely move about and they will be more than happy to party with anyone chunking or drifting cut bait to the bottom of the bay. White perch are moving to deeper waters and can be found in some of the deeper channel areas near the mouths of tidal rivers. They prefer to hold over hard bottom; using a dropper fly rig tipped with pieces of bloodworms or a simple bottom rig will catch them. As November progresses and waters continue to cool, the white perch will move into ever deeper water near the river mouths or out in the bay. Gizzard shad will do the same, and on depth finders they can be easily misidentified as white perch or even striped bass. Surface water temperatures are about 54 degrees, several degrees cooler than in the tidal rivers. Traditional bait species such as bay anchovies and small menhaden continue to move out of the tidal rivers and move south through the bay. 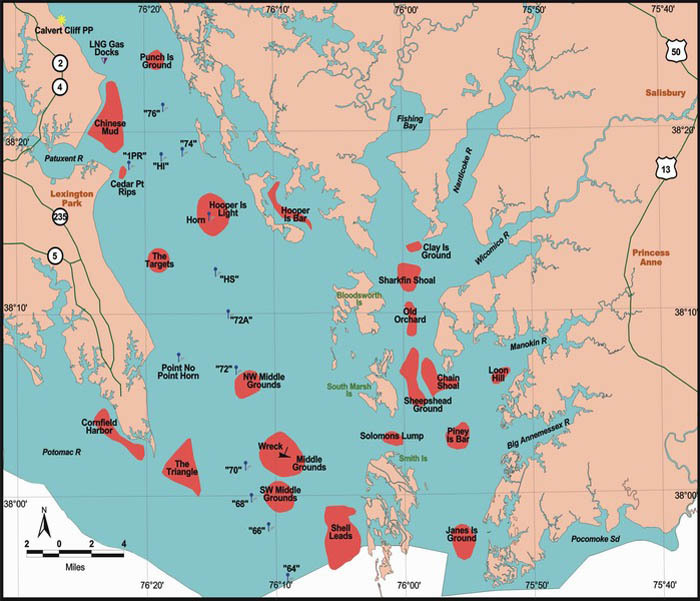 Young of the year river herring and hickory shad are beginning to join that exodus, and striped bass will be waiting in line for them in the channels leading to the bay and the shipping channel edges. Breaking fish are being spotted in the region and are often small, 12-inch to 14-inch striped bass. Jigging underneath with large soft plastic jigs in the 6-inch size range can produce large striped bass. Spotting suspended fish on a depth finder and giving jigging a try is a favorite fall activity. Generally speaking the action has been somewhat slow recently, but a windless day without rain is hard to pass up this time of the year. Trolling a mix of umbrella rigs and tandem or single-rigged sassy shads, spoons and bucktails has been popular. Inline weights are needed to get the heavier offerings down and planers will work for single lures. Trolling along the shipping channel edges and the False Channel have been popular in 30 feet of water or more. Another alternative is to troll along shallower channel edges in the lower sections of tidal rivers with bucktails dressed with a twister tail or sassy shad or medium sized diving plugs. 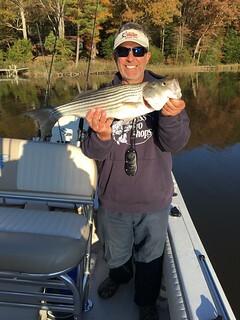 A couple of flat lines behind a small boat is a great way to troll in the rivers and pick up striped bass in the transition areas between the deeper channels and shallower areas, especially in the morning and evening hours. The shallow water striped bass fishery is still alive this week and those who can find a windless morning are doing well by casting topwater lures along shallow shore line structure. Casting crankbaits and swimshads near deeper structure such as piers is also a good tactic. The shorelines of the tidal rivers, Thomas Point and Poplar Island are but a few of the places to cast lures in the morning and evening hours. White perch are holding in about 25 feet of water in the lower sections of the region’s tidal rivers and creeks over oyster bottom. A dropper fly rig with pieces of bloodworm on the flies or small jigs will do the trick. A simple two-hook bottom rig baited with bloodworms is a traditional method when fishing deep for white perch. A good depth finder or knowledge of oyster bars is essential to good success. As water temperatures decline, the white perch will head to even deeper water. Prospects for striped bass fishing look good if and when the weather cooperates. 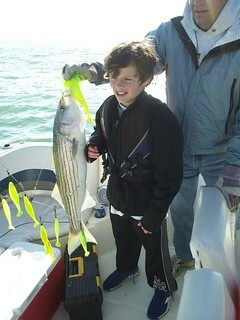 The water clarity has been good and striped bass are being caught by a variety of methods. 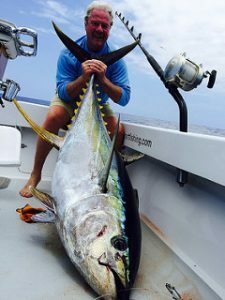 Trolling has been the top game in town – it is a good way to cover a lot of territory when looking for those fish that will bite. Most anglers are using medium-sized bucktails dressed with twistertails or sassy shads, swimshads, spoons and diving crankbaits. Umbrella rigs are popular behind heavy inline weights. The steeper channel edges tend to be the best place to find striped bass suspended at 30 feet or more. Keeping a careful eye on depth finders is a good tactic this time of the year, much like following a good bird dog. 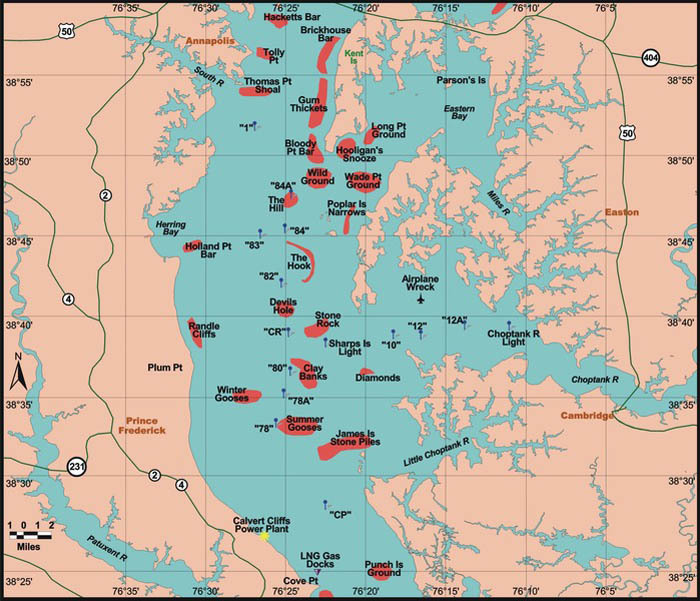 The edges of the shipping channel in the bay or the channel edges in the lower Patuxent or Potomac rivers and Tangier Sound are all good places to troll. Jigging alone the region’s channel edges when fish can be spotted on a depth finder is a classic fall tactic, as is jigging underneath breaking fish which are usually 12-inch to 14-inch striped bass. Larger fish can be lurking deep underneath the surface action. There are still some who are chumming and chunking with moderate success along the steep channel edges of the lower Potomac near St. Georges Island, the mouth of the Potomac and north of Point Lookout. Casting topwater lures and deeper running lures near piers and jetties along the western side of the bay has been a good way to enjoy some light-tackle action in the mornings and evenings. The lower Potomac River, St. Marys River and the ever-popular Cedar Point Light are all good places to try a variety of lures. 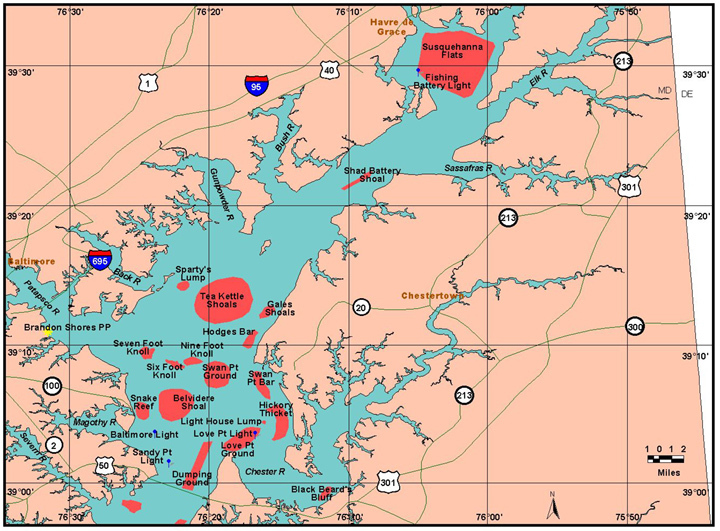 On the eastern side of the bay, the cuts at Hoopers Island and the marsh edges and creek mouths of Tangier and Pocomoke sounds are excellent places to fish. There tends to be a fair percentage of small fish but plenty of fun all the same. Fishing for white perch continues to be good in the lower sections of the eastern and western tidal rivers. They can be targeted in about 25 feet or more of water, usually over an oyster bar. A careful eye on a depth finder will help to spot them when they are schooled up. A two-hook bottom rig baited with pieces of bloodworm or a dropper rig with small soft plastic jigs or flies tipped with pieces of bloodworm are the best way to catch them in deep water. Channel catfish and blue catfish can often be found in the same areas due to low salinity values and can be caught on cut bait. Cooler water temperatures tend to spur catfish into becoming more active and can provide lots of fun fishing in the tidal rivers. Colder weather and briskly running streams and rivers are making for some good trout fishing in western and central trout management waters. The catch-and-release or fly-fishing only areas offer rewarding experiences for those seeking some fun action and aren’t worried about bringing dinner home. The put-and-take areas that were stocked in October still have plenty of trout to be caught by those willing to make the effort. It is time to put the Powerbait away and think about casting small spinners, spoons and even tiny jerkbaits if using spinning tackle. 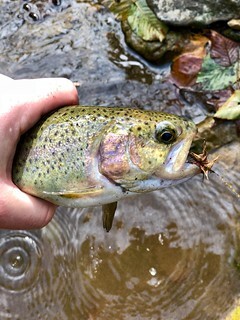 Fly casters will be using nymphs, streamers and wet flies with good success on the trout that have wised up and realize they are no longer in a hatchery raceway. 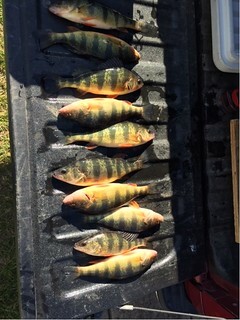 Fishing for a mix of walleye, yellow perch and smallmouth bass has been good at Deep Creek Lake. Drifting minnows along the edges of deep grass or steep rocky edges has been a good way to catch them. Lip-hooking a minnow with a jig and working the bottom is also a proven tactic. The upper Potomac is running hard from recent rains and with more rain on the way it is doubtful conditions will improve anytime soon. Fishing for largemouth bass continues to be good this week as the bass are urged by falling water temperatures to feed as much as possible. The transition areas between shallow and deep water are good places to target with spinnerbaits and crankbaits. Crayfish are a hot item on the bass’ dinner menu so crankbaits and jigs that resemble crayfish are a good choice when fishing the transition areas or sunken wood. Cooler water temperatures also mean that largemouth bass will be feeding long into the day, and sometimes they can be found soaking up the afternoon sun in shallower waters. Cooler water is much to the liking of chain pickerel, and they are very active. They can often be found holding near fallen treetops and branches along shorelines, and the really large ones are in open water near sunken structure. 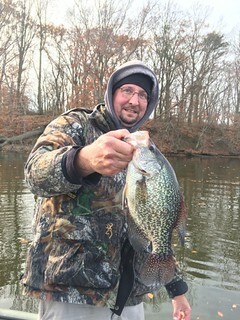 Crappie are schooling up near structure and offer excellent fishing opportunities this time of the year. Marina piers, bridge piers and fallen treetops are all good places to look for them. A minnow or small jig under a bobber is a great way to catch them. Surf casters waiting for the anticipated run of striped bass on their way south have perhaps a few more weeks before they arrive. In the meantime these anglers are soaking finger mullet or cut baits for small bluefish and bloodworm baits for kingfish. 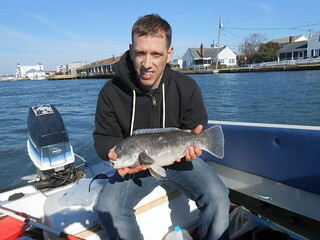 At the inlet and the Route 50 Bridge area, tautog are being caught. Many are under the 16-inch minimum but there is plenty of action. Pieces of green crab and sand fleas have been the most popular baits. The daily creel limit for tautog increased to 4 per day Nov. 1. Flounder are still moving through the inlet and a few continue to be caught, but this fishery is winding down for the season. Bluefish have been coming into the inlet at night and providing plenty of good fishing. Striped bass are also being caught with a few of them measuring over the 28-inch minimum. The Route 90 Bridge area has also been a fun place to catch striped bass that are mostly under the 28-inch minimum. The captains taking parties out to the wreck and reef sites offshore report excellent fishing for sea bass with limits occurring around the rails. Large flounder continue to be an exciting bonus catch and large tautog are becoming more common. Weather is always an issue when trying to fish offshore in the fall, but lady luck smiled on a few boats that ventured out to Poormans Canyon and scored on some very nice yellowfin tuna in the 65-pound class size. A few swordfish are also being caught at the canyons.